The ‘Camera’ function has been added to STYLY WebEditor. This camera function has two modes, ‘Manual’ mode and ‘Automatic’ mode. 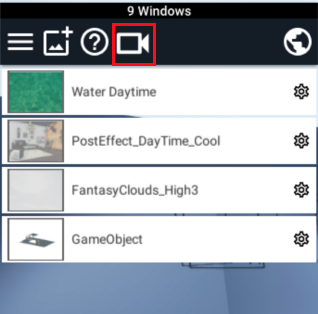 In either mode, you can record a video of your VR scene by using this function in WebEditor. By creating a video from the scene you designed, you can show it in more attractive way. In this article, I explain how to use the camera function in WebEditor. When you launch WebEditor, you will find the camera icon on the top of the window. This is ‘WebEditor camera button’, so click it to activate. The top buttons on the ‘WebEditor Camera’ screen work as follows. ① Edit button: Press it to go back to the Edit mode. 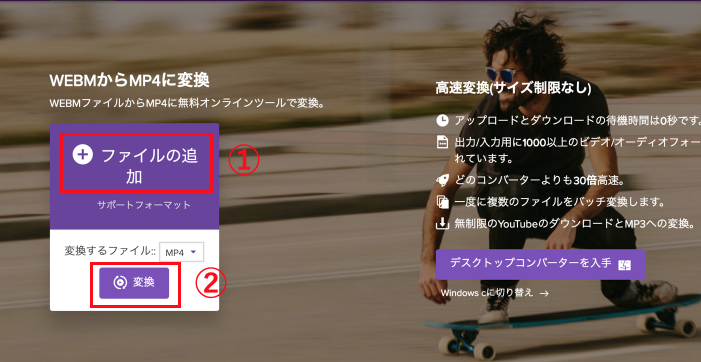 ② Manual button: It opens this tutorial on new tab. 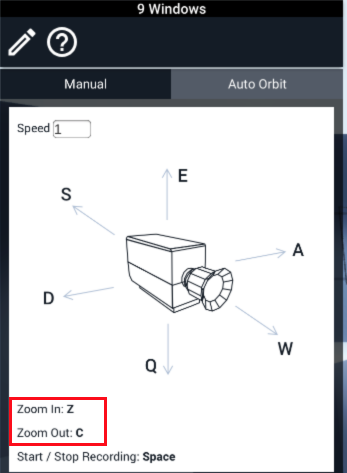 By clicking the ‘Manual’ or ‘Auto Orbit’ tab, you can switch between ‘Manual’ and ‘Automatic’ mode. In the Manual mode, you can record a video while moving the camera as shown below. In the Manual mode, hit the Space key to start recording what currently appears on the screen. You hit the Space key again to stop recording. 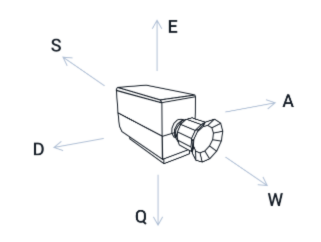 The key operation to move the camera in each direction is shown in the manual-mode screen (See above). Zoom in by holding down the ‘C’ key. Release the ‘C’ key to go back to the original scale. Zoom out by holding down the ‘Z’ key. Release the ‘Z’ key to go back to the original scale. You can adjust the moving speed of the camera by the ‘Speed’ value in the top-left corner. This speed setting is applied to both the moving speed and the zooming speed. There are two ways to change the value. 1: Enter the value directly. 2: Point ‘Speed’ with the mouse and drag to the left or right. Drag to the right to increase the speed. Drag to the left to decrease the speed. 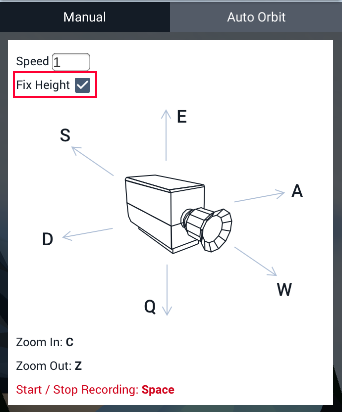 If you check Fix Height, even if you change the camera angle up and down, it moves to the direction of the camera when checking Fix Height. 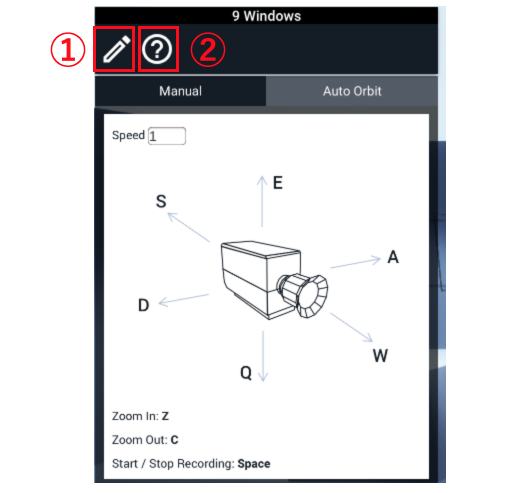 In the Automatic mode, you can record a video rotating around an axis as shown below. 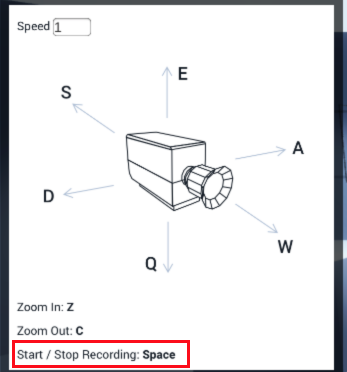 ※Since you can change the moving speed, start and stop recording in the same way as the Manual mode, the explanation is omitted. In the Automatic mode, click the ‘Move Axis’ button to adjust the position of the axis the camera rotates around. 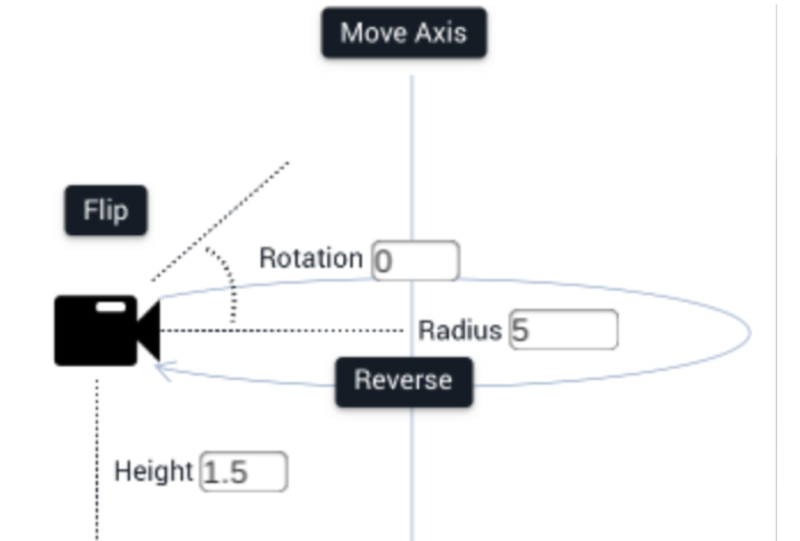 Adjust the axis for camera rotation. The axis is shown by the black and white marker at the centre of the screen. 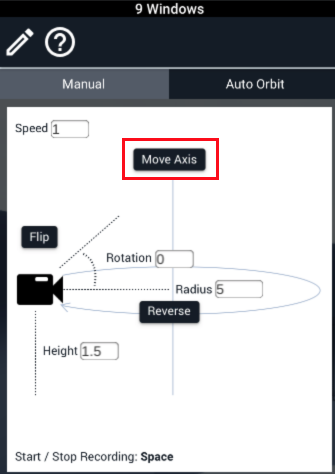 Set the axis position as you like by repeating the sequence: press the ‘Move Axis’ button; adjust the axis position; press the ‘Finish Moving Axis’ button. You can set the radius of the rotation by adjusting the ‘Radius’ value. 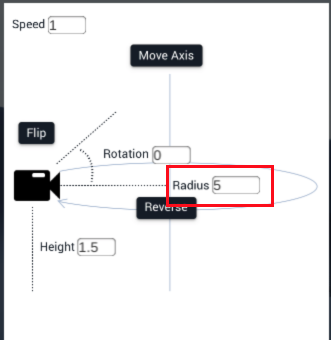 In the same way that you adjusted the moving speed, you can adjust the radius by dragging ‘Radius’ to the left or right in addition to the direct value input. You can set the camera angle by adjusting the ‘Rotation’ value. As a guideline for the rotation value, 180 and 360 correspond to half rotation and one rotation respectively (i.e. the unit is degree). In the same way that you adjusted the moving speed, you can adjust the angle by dragging ‘Rotation’ to the left or right in addition to the direct value input. 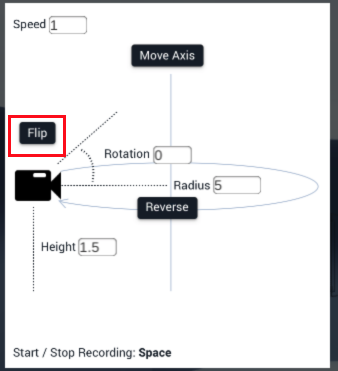 You can flip the camera by clicking the ‘Flip’ button. It has the same effect as setting the ‘Rotation’ value to 180. In the Automatic mode, you can reverse the rotating direction by clicking the ‘Reverse’ button. The rotating direction is reversed. You can change the height of the camera by adjusting the ‘Height’ value. In the same way that you adjusted the moving speed, you can adjust the height by dragging the ‘Height’ label to the left or right in addition to the direct value input. 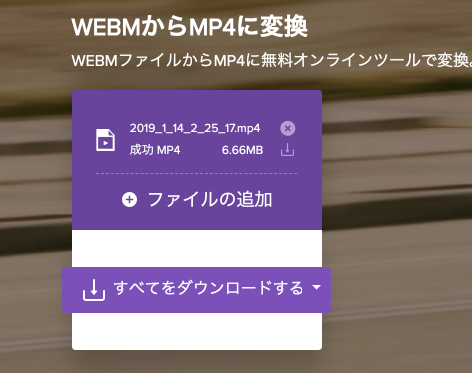 The recorded movie is saved as a WebM movie file. As an advantage, you can immediately play and check the WebM movie file by dragging it into Google Chrome. However, it doesn’t have high compatibility with mobile devices and players, so let’s convert it into MP4 that has higher compatibility. Access ‘media.io’ (https://www.media.io/jp/convert/webm-to-mp4.html), a free converter. ① Click ‘Add your files’ and select the saved WebM file. ② Click the ‘Convert’ button. When the conversion is completed, the screen shown above appears. Press the ‘Download All’ button. The downloaded file is zip file. Once it’s uncompressed, it will be an MP4 file. MP4 file can be uploaded to various SNSs such as Twitter, Instagram, in addition to YouTube. That’s all for the introduction of WebEditor Camera function.